There are lots of misconceptions and clichés around Mexican cuisine, thanks to global chain restaurants and generic, stereotypical supermarket offerings. Meal prepping is an easy way to have healthy food already prepared and portioned for you to eat during the week. This way you avoid succumbing to food cravings, not knowing what to eat after a busy day, and most importantly you know the highest quality ingredients have gone into your meal. We chose to cook wild salmon and pasture-raised chicken breast, but feel free to prepare whatever variety of protein you prefer. You can also cook another tray or two of veggies and protein to have more prepared meals on hand for the week ahead. This is also a great way to save money. You can take in these meals in to work for lunch, instead of spending money eating out. If you usually eat out for lunch or dinner, many restaurants use poor quality oils and salts, and this can cause inflammation, water retention, and bloating. When you cook your own meals with high quality avocado oil, organic olive oil, and pink Himalayan sea salt, you’ll notice you feel very different after eating when compared to how you feel after eating a meal out. We hope that this simple recipe becomes your weekly ritual. Please comment below to let us know your favorite vegetables and protein to meal prep! Prepare all of the vegetables and chop them into bite sized pieces, and then divide evenly. 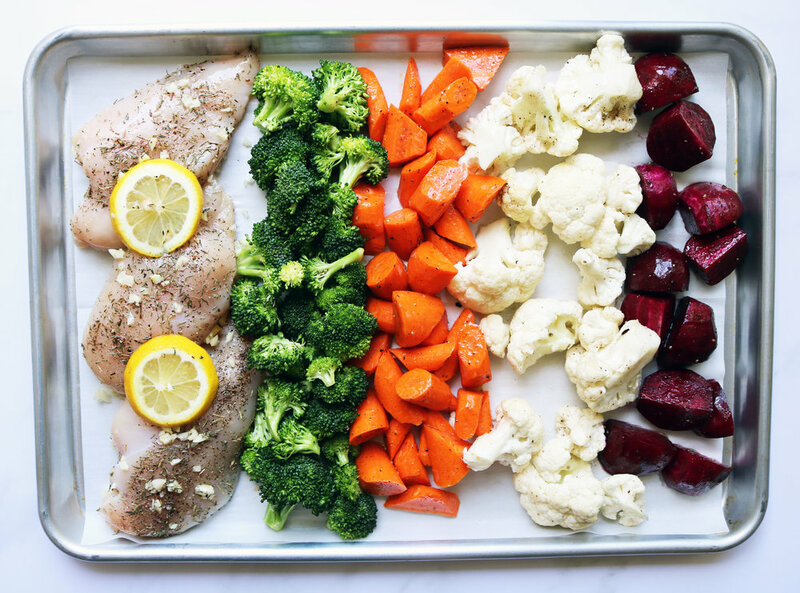 Spread the vegetables evenly in rows on two separate baking trays and bake for 15 minutes. After 15 minutes, add the protein, and drizzle with olive oil and salt and pepper. Then slice lemon and place on top of the chicken and salmon. Rub the chicken with the minced garlic and chicken seasoning. Bake the chicken and salmon for 15 more minutes until fully cooked. Divide each individual serving of the protein into a Tupperware container and evenly portion out the vegetables as well. You will have 6 meals worth of food prepared to eat for the week.